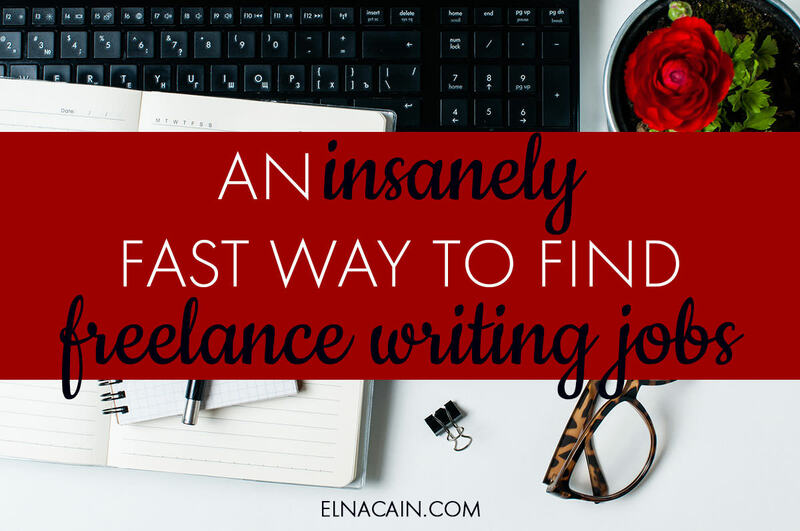 Are you just breaking into freelance writing and ready to get paid to write? If you want to earn money quickly, the best way to do this is with freelance writing job boards. I know not everyone thinks job boards are the best way, but I’ve had great success using them and I know you can too! I started my freelance writing career using job boards and even more than a year later I still use job boards when business is slow and I need to pick up a few clients. There’s a lot of competition. Hundreds of writers, bloggers and aspiring writers check these free job boards daily and to get ahead of everyone you need to work hard at getting noticed. You have to check several job boards to see all current listings. For example, I check up to six job boards, and go to several social media platforms for listings. I typically have to dedicate an hour or more in the morning and an hour or more in the evening. I’m a part-time freelance writer, that’s half my day gone to just trying to find jobs! So, it’s time intensive, but the good thing about it is it’s free! And if you’re bootstrapping your freelance writing business, then Contena is the way to. But, I soon learned that if I wanted to improve my pitching process and have the best odds at landing consistent and recurring freelance writing jobs, I needed to start looking at paid job boards. As a new freelance writer I wanted to maximize my productivity with what little time I had. And the first thing I did to help me free up time was to sign up to a paid job board. I’ve used a few paid versions and by far the best one is Contena Pro. Kevin and his crew curate the best quality freelance writing jobs from multiple sources, making it super easy to sort through job listings. And for this work-at-home mama with twin toddlers to take care of and client work to submit, this makes it a cinch to quickly find jobs to pitch to go. If you’re interested in signing up for a membership, I want to show you how I use Contena Pro to land writing gigs. It’s insanely fast and customized so that I don’t have to waste time reading job ads that aren’t in my niche. (Stay tuned ’till the end for a special discount on Contena Pro). When you log into Contena Pro, you will see it’s exactly the same as the free version, except now you have more options to customize your search. This is the key to making your time spent on finding jobs shorter so that you can spend more time getting paid to write. Let’s go through each of them so you can get a better understanding of how customized you can make your searches to cut down your time spent sourcing gigs. Agency – these writing gigs are typically from content agencies. Pay isn’t the best and Contena let’s you know this by the quality score it gives each job depending on the rate. But, if you’re brand new, these types of jobs are easier to land and often don’t require much experience. Full-Time – this option let’s you see all the full-time writing positions available. Contract – usually jobs that have a contract in place are better paying and more consistent. Submissions – this is a new feature and includes publications that are looking for a one-off writing project. 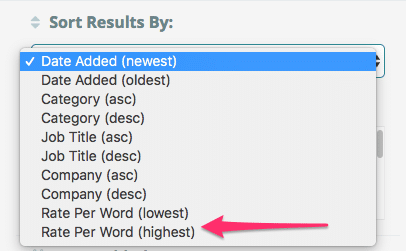 To maximize your options you can choose all four categories so you can see every type of writing gig available. However, when I use Contena Pro I only mark the Contract indicator. I’m not interested in working with agencies since my client base is primarily small businesses and entrepreneurs. And since I do this on a part-time basis, I don’t want any full-time writing gigs either. On the side you can customize your search and only see what you want. For me, I only want to see marketing freelance writing jobs with a high rate of pay. Contena Pro did a great job narrowing their search results to include the most profitable writing niches. From here you click on what you want and you’ll either be directed to the original ad or to the ad on the Contena platform. Contena Pro also makes it easy to find the important information by having the compensation and contact info displayed next to the job ad. 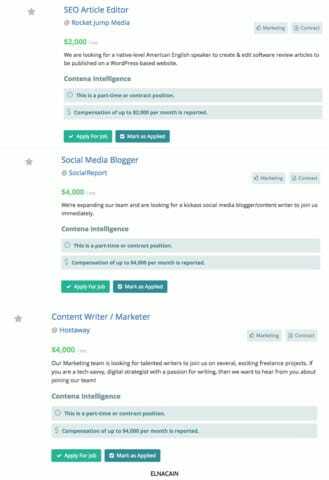 One great thing is that during your searches for a freelance writing job, Contena makes it easy to find the BEST job and will alert you if they feel a job isn’t high-paying. 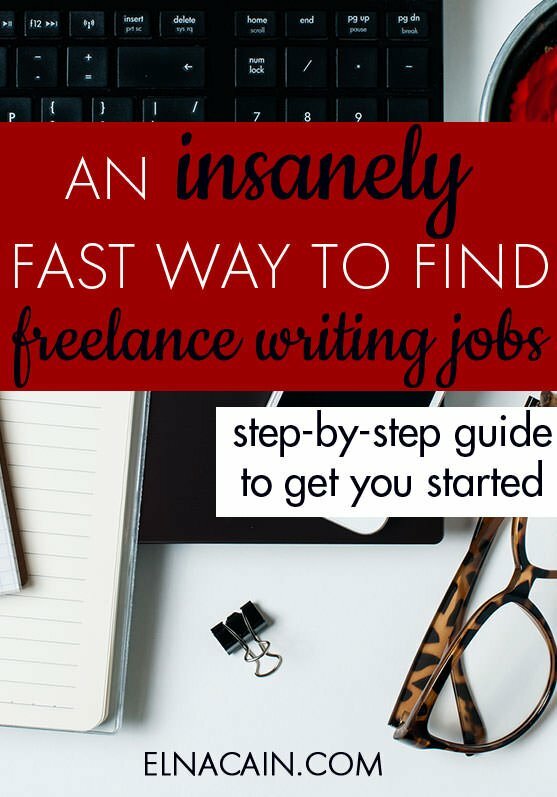 And if you don’t have a lot time, this is by far the best and quickest way to find freelance writing jobs. 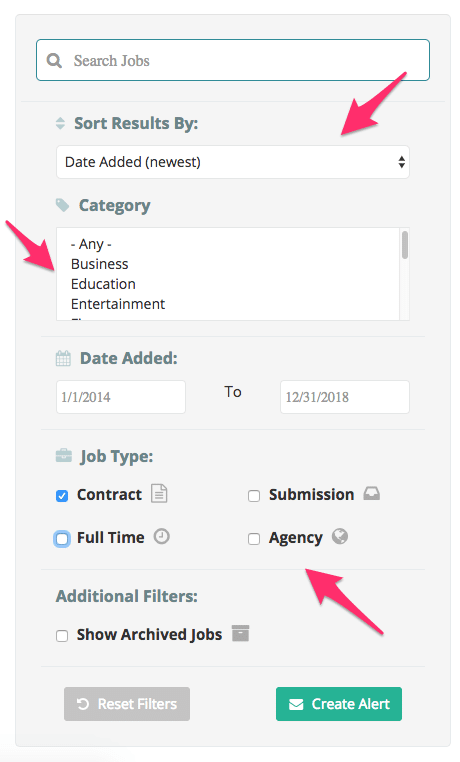 Another great thing about using this job board over others is Contena Pro will give you Alerts when a new job ad with your specific criteria comes up. So, essentially, you don’t even need to visit the job board every day. Simply check your email or Contena for the latest available freelance writing jobs. Starting a freelance writing business doesn’t have to cost you a lot of money. Even if you’re bootstrapping your biz, you just have to be smart about what you invest your money in. 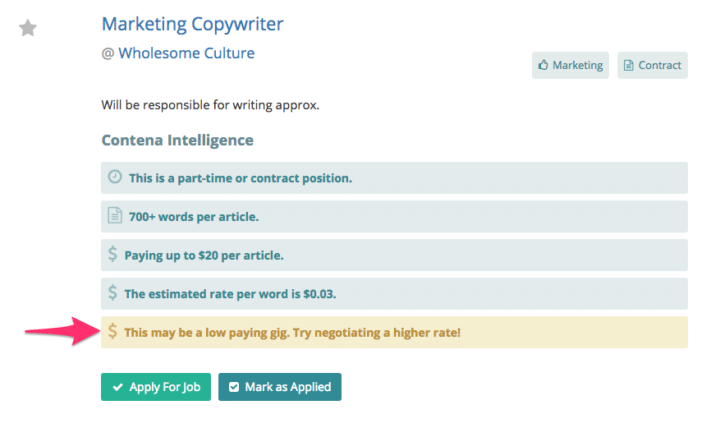 And if you want the absolute best odds at finding well-paying writing jobs, sign up for Contena Pro. 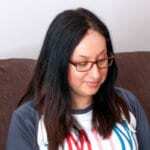 Over to you – how long does it take you to find freelance writing jobs?